Pavneet Arora has participated in TUG annual conferences since 2010 and is the local organizer of TUG 2016 in Toronto. 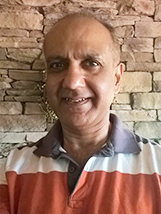 Pavneet Arora, interviewee: I have lived a somewhat nomadic life. I was born in Madras, India, far from our nominal family home in Punjab as my father was an Army Engineer in the EME Corps (electrical and mechanical engineers). At a young age, my mother, by then a widow, emigrated to Canada on her own, and we established ourselves here. My education was a product of the times, I suppose, coming as it did right after the 1960s. This was all in the public school system in Toronto, Canada. I grew up in an inner city neighborhood well before it became fashionably gentrified, but all along I have had inspiring teachers. In primary school, we had a wonderful teacher, Mr. Leeming, who was exploring open concept, mixed-grade classrooms with huge — and I mean huge — spaces dedicated to terrariums and aquariums filled with animals. I mean, how many Grade 5 students can say that their classroom housed its very own boa constrictor, and had watched it feed? He would regularly, after getting permission from our parents, pile a bunch of us kids in a Ford Econoline and take us out to a rural farm for a week, just to have us see that the planet is more than concrete and steel. It was a very hopeful time. DW: What did you think? PA: It was an epiphany, the first of many. It was as if your vision had been limited to the end of your apartment balcony, and then someone pointed out the horizon. I began to dream RPN, and then pre-ordered an HP-34C programmable scientific calculator when it was announced. It took me four months of saving up from my part-time job to pay for it. DW: What about your other teachers? PA: My literature teacher, Mr. Speichert, thought nothing of chucking everything from French existentialists, to Russian heavyweight writers at a bunch of young teenagers. So I would come out of an astronomy unit in physics one minute, and then be reading Ivan Turgenev in the next. It all just seems so far-fetched to me looking back now. My history teacher, Dr. Heydeloff, guided us through European history and economic theory through the lens of his own childhood having grown up in Germany through two horrific wars. At a very young age we were being given the vocabulary to understand and question our wider world. We were the beneficiaries, I think now, of a confluence of two trends: the idealism of the 1960s, with those who entered teaching with it as its touchstone, and a wave of extraordinary European emigres who brought with them qualifications and life experiences well beyond the norm. Perhaps I was just impressionable, but all of these imprinted on me the idea that one is truly free when one is able to explore knowledge unfettered, and that literacy is the most powerful force for the protection of personal liberty. Of course, it does get more and more difficult as one takes on quotidian responsibilities, but I have railed against accepting convention, and this has meant I have often lived with economic uncertainty throughout my professional career. I am very excited to see that we are now celebrating young people who aspire to be tinkerers. I think the term “Maker” is perfect, and it is uplifting to see the success of efforts like Raspberry Pi, and the now ubiquitous availability and acceptance of open source software. DW: How did you first become involved with TeX? PA: Ironically, my typesetting history has been more aligned with troff than TeX. My father's younger brother worked at Bell Labs in its heyday, and so I was exposed to Unix at an early age. I must still have the documentation for Documenter's Workbench Tools somewhere in my library along with a full printed set of System V man pages. I remember him recounting to me that the secretaries, which I realize is now a term relegated to near antiquity, took training courses in troff and were quite adept at cranking out documents using troff markup. And then when I was working on my Master's thesis, the university I attended had a format package for troff, so I gravitated towards that. It was at that time that one of my grad student friends chose, instead, to use TeX, which was novel, but I was too immersed in my own work. DW: What university was that? PA: It was at the University of Waterloo that I did both my undergrad and Master's in the Dept. of Systems Design Engineering, a programme that focused on inter-disciplinary aspects of engineering. I ended up being fascinated by statistical pattern recognition, and so that is what I pursued for my Master's. DW: What did you do after university? PA: I soon recognized, after my first few jobs, that I was not a good fit for the corporate world. Along with my business partner, we had a small venture that, truth be told, wasn't very successful. The short explanation is that what I had to offer, the market rejected. I say this with very few regrets, and without the slightest wish to sound maudlin. The most that one can reasonably expect is, to put it in baseball terms, the chance to step up to the plate. After that it is a combination of one's skill, judgment, and timing that determines the outcome. Whatever the outcome, though, it doesn't diminish in the slightest that to take bat in hand and swing for the fences is in itself a privilege: this is what gives entrepreneurship its vibrancy. I wrote an early text-based email agent using the curses programming library, which my partner and I hoped would find a place with “business” Unix users. And then, for a decade we latched onto NeXTSTEP and OpenSTEP, and developed applications for it. NeXTSTEP arrived with native OOPS, Display PostScript, Bit blit printing technology, Unix, the very elegant syntax of Objective-C, and applications like Lotus Improv. This, not too long after Microsoft Windows had just managed to go from tiled windows to overlapping ones! We thought that we had stepped into the future. We misjudged just how enduring the beige box hegemony would be, and how long it would last. I think that the PC era is mistakenly associated with personal computing. In reality, DOS and Windows were adopted mainly by corporations, whose employees then brought them into their homes. The real personal computing revolution only happened with mobile. We had been unsuccessfully bashing our heads against the Microsoft juggernaut for so very long. You dig a financial hole, and it is hard to ever really catch back up. I was thoroughly worn out and dejected with the technology sector by this time. Somehow I ended up landing in construction. This was a tremendously gratifying experience. It released me from being bound by the very narrow definition of success that I had. I was doing something practical with my hands, and it all hearkened back to the idea of Quality that Robert Pirsig talked about in Zen and the Art of Motorcycle Maintenance. I met some amazing craftsmen, many of whom I consider my friends today. Breaking communal bread, so to speak, on construction sites led to some unusual conversations. I remember once someone initiated a conversation about the Higgs boson; not long earlier I had read Herman Wouk's A Hole in Texas which was dedicated, I think, to his scientist brother Victor. It also amazed me to find a very high level of numeracy amongst the trades in spite of their often having struggled in school. This being North America, there was a fluency in fractions — for example, 1/16 inch and 1/32 inch with carpenters — that I found simply dazzling, and it convinced me that some parts of mathematics, at least, should be accessible to nearly everyone given enough practice. You hold a combined metric/Imperial units measuring tape — the type common in Canada — and you are holding an everyday example of nomography. How amazing is that? It also got me into architecture, and in particular the works of Frank Lloyd Wright. I ended up visiting quite a few of his houses around this continent before finally building a home inspired by his Prairie style some years later on. 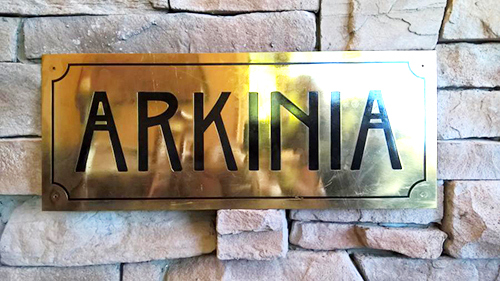 I named it Arkinia, which is a play on words on the ideas of ``a home for `our kin''\,', and the ``ark in'' which we could find shelter or sanctuary. I had walked by a hole-in-the-wall sign shop located deep in the pedestrian bazaar near my mother's apartment in Gurgaon just a couple of days before returning to Toronto. The proprietor wasn't there, but I got his mobile number from the person manning the shop on his behalf. Later that day I called him from IGI (Delhi) airport on my way out to Pune where I was going just for a day, and asked him how long it might take to have a plate made and how I might get him artwork. He said three days, and a TIFF file. When I asked him about a deposit he said not to worry, just get him the details and he would work on it — I could pay him when I came to visit him at the shop! I also explained that three days would be too long, as I would be leaving before then. He assured me that he would get it done before I was to leave. I prepared the artwork while waiting for my flight. Initially, I attempted it in LaTeX, but was unable to get the font to work, and so switched to GIMP under Ubuntu on my laptop, outputting to TIFF. I then sent it along to him via email, all while sitting in the departure lounge. IGI had free WiFi long before many other airports did, and it was commonplace to see people pounding their laptop keyboards. Well, upon my return to Delhi I phoned the shop, and of course the sign wasn't ready. I was told that it would be a few hours yet, and if it was later than that he would deliver the plate to my mother's apartment. I was to leave for Toronto that evening with not much time remaining before my taxi was to arrive. I went to the shop in order to at least pay for the plate, and fortunately by the time I got there it was waiting for me packed for travel. Although, I have no doubt that he would have even delivered the plate to me at the airport should it have been later! DW: Please say a few more words about what your business does. PA: For the past several years, I have undertaken projects related to high-end audio/video along with a huge dollop of automation and controls, in both residential and commercial construction. This is transitioning at this point as all of these are transferring to IP, and so placing a heavier load on the network infrastructure. So we have some interesting work coming up, I hope, in teleconferencing, digital home healthcare, and the Internet of Things (IoT). We continue to emphasize heterogeneous solutions following the Unix philosophy, although I must say that the ``new Microsoft'', with its support of open source solutions and the willingness to make its own offerings interoperable with them, also has great appeal in our framework. So, for instance, we use OpenWrt, pfSense, FreeNAS, rsync, etc., even if our clients are completely unaware that these are the components which are driving the solution. Ultimately, I try my best to embrace each and every opportunity as it comes. DW: Let's return to the question of when you first (truly) got involved with TeX and seriously interested in typography? PA: One of my career stops was at the Royal Ontario Museum in their nascent IT department where my manager, Mark Dornfeld, was the one who inspired me to take typesetting seriously. He is an archaeologist by training who fell into Unix. He brought SCO Xenix into the ROM, and then SoftQuad's troff. His vision was to leverage the multi-user capabilities of Unix to develop collaborative workflows to guide exhibit documentation, and project management schedules. At some point later in my self-employment phase, I wanted to bring a typesetting structure to my documentation, and so I downloaded MiKTeX onto my Windows laptop, at which point I started to use it for general document creation. It took until my desire to create a web resource to aid young people struggling with mathematics to really embrace TeX as a way of life. I presented that work at TUG 2010 in San Francisco: Using LaTeX to generate dynamic mathematics worksheets for the web. That paper is dedicated to my mathematician grandfather, Prof. Bansi Lal, who is renowned for his textbooks in the areas of geometry, algebra, and calculus. Prof. Bansi Lal was honoured at his university with a student apartment block named for him. 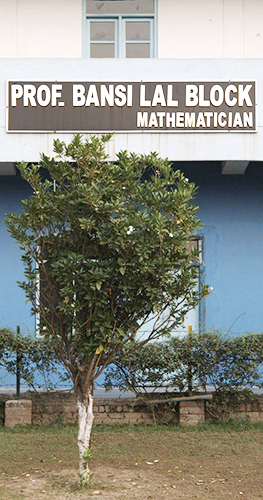 During my project's development, I had flashbacks of my childhood visiting my grandfather's printing press in Jullunder, Punjab, where all of that math was typeset traditionally in a dusty, noisy press room, and where technicians would use tweezers to pull characters from letterboxes to put together pages of complex mathematics. I still am left trying to figure out from where he might have ordered the metal type for his books. I only wish I had had a chance to talk with him about the world that was all consuming to him. I can only dream of what would have been some very amazing conversations. Isn't it the curse of the young to perpetually miss the opportunity to see the remarkable lives of their elders as their own older selves will one day see them. It fills me with great regret, but at the same time it connects me to that family history. DW: Was your grandfather who wrote mathematics books the same person as your grandfather who printed books? PA: He was one and the same. He authored the books, but was dissatisfied with the contracted output. So he ended up buying a printing press, and taking over the process end-to-end. Doesn't that sound similar to what led DEK to the development of TeX? I have vivid memories of my grandfather coming home, while we were visiting him, and with a dip pen and different colours of fountain pen ink marking up proofs in the evenings, and then going back to the press to have the corrections made. 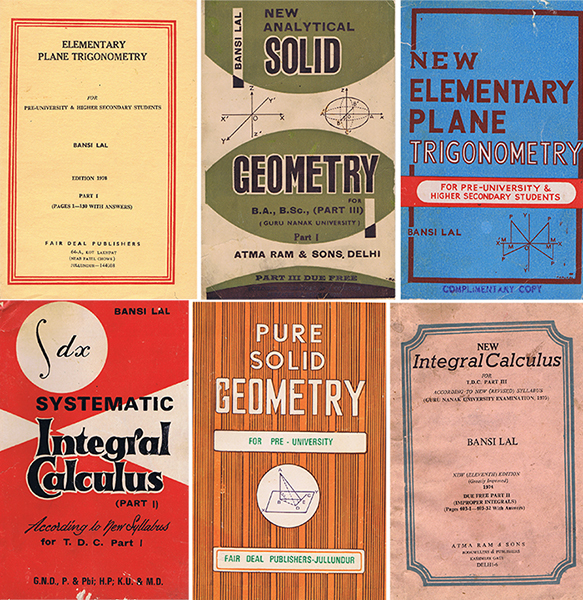 Covers of books that Prof. Bansi Lal wrote and printed. PA: Since then, I have been using mainly ConTeXt to develop what I like to term as “specification-driven documentation”. That is, the specification is in a form other than TeX and its dialects, with an emphasis on YAML, along with scripts to generate the desired output on demand. DW: Please say another word or two about YAML for those of us who don't know what it is. PA: YAML is a simple markup language that has a close association with basic data structures such as hashes, arrays, and strings. Support for it is available in nearly all modern languages — Ruby, Java, C#, etc. I was looking for a structured representation for my specifications that was human readable. The hope was that in the field, I should need at most Vim to create and edit specifications, and even pen and paper would suffice should it come to that. I found XML too unwieldy, and preferred the minimalism of YAML. The specification creation is often done with little time available, but I was still seeking a consistent representation that could capture information. It is a plain text file, like TeX source, but as can be seen, structured and machine-processable. DW: Why do you prefer ConTeXt to LaTeX for what you are doing with YAML, and in general? Can you give a couple of examples of aspects of ConTeXt that particularly appeal to you? PA: I met Hans Hagen, the creator of ConTeXt, in San Francisco and was impressed with the structured nature of ConTeXt. It fit the way that I was thinking about page elements as well as documents. In another area of construction, a great need in electrical work is the proper labelling of panels. They often have a combination of single-pole, double-pole, and tandem breakers, and with this setup, horizontal alignment of the breakers with the panel slots isn't regular, which places some heavy constraints on vertical cell merging when typesetting. So I have used ConTeXt's natural tables to typeset panel documentation for line voltage, alarm sensor, and data network port panels. In one instance, I had put together some rather detailed panel documentation for a complex alarm system, and when that system went haywire in the middle of the night (naturally) due to a failed water sensor, the client was able to diagnose the problem with the aid of those panel diagrams. I imagine that had they been forced to trace back wire labels through a mess of wire bundles, that their experience may have been less than satisfactory. It does put a smile on my face to think that somewhere out there, electricians are referring to documents created using GUST Type Foundry fonts and ConTeXt! DW: Do you keep up with the latest versions of ConTeXt (context-minimals)? PA: I was fortunate to start with ConTeXt MkIV, and so that is where I have stayed. As such I wasn't forced to undergo a migration across major versions. My needs don't change very often, although ConTeXt does. I update only occasionally. I have a set of core templates that have evolved with my projects, and I try to stick to the capabilities within. My ConTeXt literacy is still rather low, I feel, and so I rely heavily on the assistance of those on the ConTeXt mailing list to help me. Hans has encouraged me to do a deeper dive into LuaTeX, and I hope to carve out some serious time to do that. I have some ideas about projects, but don't have enough mastery of ConTeXt to have the confidence to undertake them quite yet. DW: Do you remain happy with your choice of ConTeXt? I ask this because sometimes I have made choices that I later regretted, but so much of what I do depends on what I am doing by then that I cannot change to something that would have been better. PA: This is an excellent point. An entrenched path can become the default choice after a while even as one begrudges that choice. In my case, however, I continue to be very happy with my committing to ConTeXt. Even with my limited skill it has allowed me to solve the problems that I am trying to solve. DW: Please tell me how you came to be “officially” involved with TUG. PA: I hadn't thought about it at all really. It was suggested to me that my use of TeX in industrial applications, and I guess my business experience might be of use to the organization. From my end, I am extremely grateful for all of the community contributions that make up TeX, and so wanted to offer up whatever experience that I had to the furthering of that community. DW: What do you see as the value of the TeX community and TUG? PA: I like that the TeX community is peer-to-peer with little hierarchy. Ideas and contributions flow freely across the entire community, and that too its reach is international. I see TUG as a facilitator for the information flow from and to its members, while also documenting and communicating notable developments. DW: Your use of TeX, or rather ConTeXt, seems a bit out of the ordinary. In any case, what is your motivation for writing-up and presenting/publishing what you do with TeX? PA: Personally, I don't find it that out of the ordinary. My interest is in workflows, and so the typesetting forms only one part, albeit a crucial one, of that. When large data-base management systems ruled, one was forced to learn different “report writers”. These were very often proprietary in nature and offered only crude formatting functionality — really little more than grouping and aggregation. As I mentioned at TUG Boston, fitting engineering problems into a Model-View-Controller framework makes it natural to see TeX as a good fit for generating sophisticated (and beautiful) views. DW: Please tell me about your aims in organizing TUG 2016. PA: For TUG'16, I wanted to emphasize the contributions of local artisans in the fields of typesetting, printing as well as publishing, even if they weren't directly TeX related. It was my hope, ultimately realized even though I felt that it was a bit of a long shot, that we might also be able to attract some special speakers to provide a wider view about typesetting beyond TeX. Over the years I have become less timid about reaching out to people, something that shocks those who knew the younger, painfully shy me. So I spent a great deal of time phoning and writing to people in order to make them aware of just what a unique group of individuals attend TUG conferences, and how wonderful an opportunity it is to come and meet them, and to participate in the discussions. DW: What do you foresee in the future — with TeX and TUG and with your life more generally? PA: Without trying to be flippant, I do sometimes think back to my reading of the words that J.D. Salinger gave to Esmé when she addressed Sergeant X in For Esmé with Love and Squalor. Taking liberty with the text: I hope to get through with my faculties intact. That, to me, seems a not unworthy goal. My children are my counterbalance: my foibles provide them with an endless source of amusement. Just in the past year, I have gotten on a small dirt bike because of my son, and had discussions with him about the beauty of the twelve-string guitar: he is an excellent guitar player. My daughter continues to amaze me with her fierce independence. Recently, she and I have had some wonderful talks about the notes composition of artisanal scents, and the “noses” who crafted them. I have a number of TeX-related project ideas, and hope to present the results at upcoming TUG conferences. If I have a wish, professionally speaking, it would be that I could have an opportunity to make meaningful contributions in the IoT space. That would allow me to bring to bear all of my experience in automation and controls, combining it with my background in AI to leverage the machine learning capabilities now accessible through cloud services. At TUG Darmstadt, I talked about ToT or TeX of Things so this would have a TeX tie-in as well. DW: Thank you very much for taking the time to participate in this interview. I look forward to seeing you at TUG 2016 in Toronto.